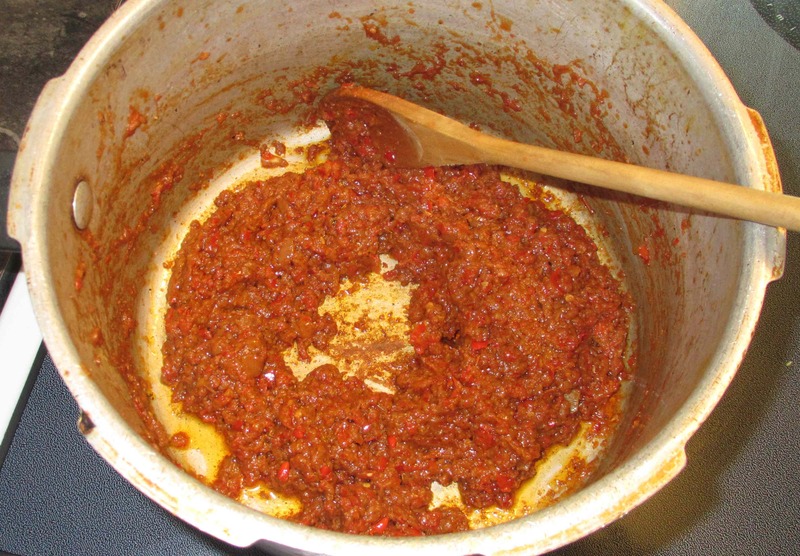 In a previous post featuring an Indonesian spice blend called Sambal Terasi I noted that one of the ingredients, a dried shrimp paste called Terasi, is also known on Malaysia as ‘Belacan’. 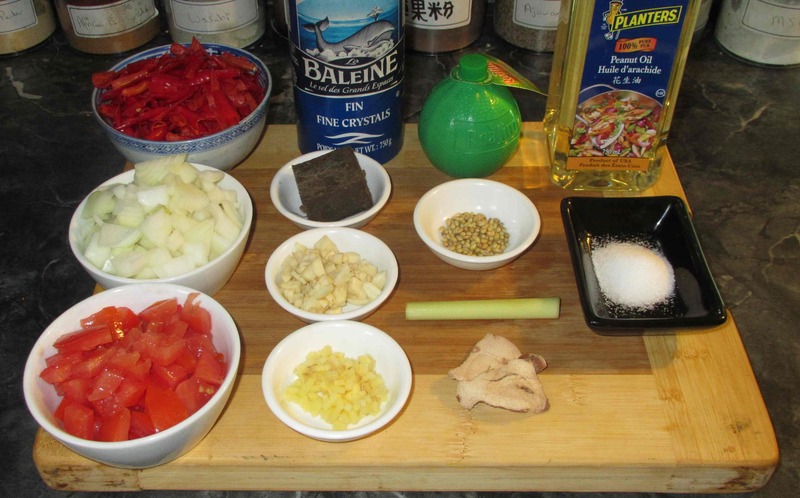 Not unnaturally, Malaysia has a preparation similar to Sambal Terasi called Sambal Belacan, and, as with the Indonesian variety, there is a great deal of diversity in the constituent ingredients and the methods of preparation. First, toast the coriander seeds in a dry pan and then grind them together with the dried Galanga. Sift the result to remove any hard fragments that still survive. Toast the Belacan in a dry pan at fairly high heat, breaking it up as you do so until it forms a dry crumbly powder. This is quite an ‘aromatic’ operation and, though I like the smell, some people like to keep the windows open or do it outside. 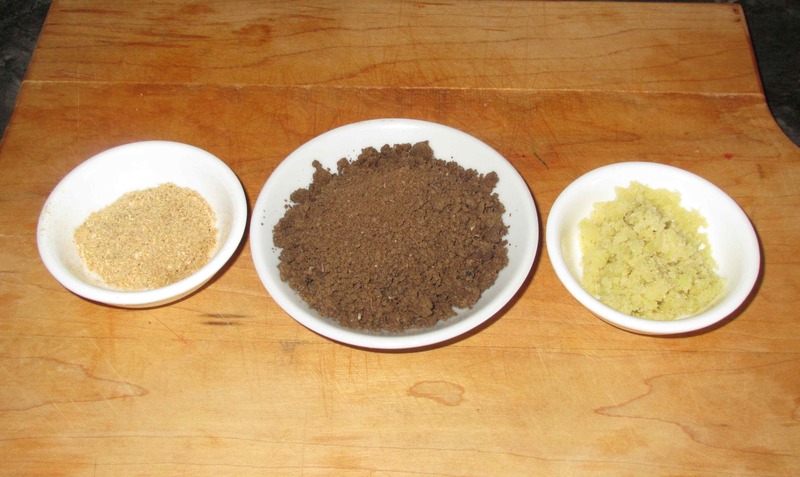 Finally, finely chop the lemongrass stalk and then grind it to a paste along with the salt using a mortar and pestle. 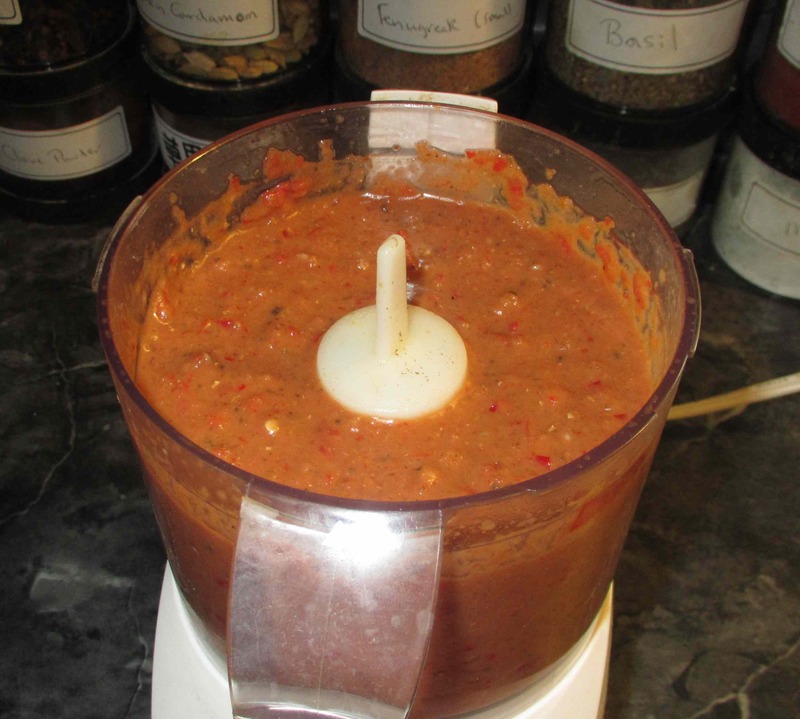 Blend all the ingredients in your food processor until it becomes as smooth a paste as possible. Heat a suitable pan over a high flame and add the paste. Once it begins to steam and bubble vigorously, you will need to stir constantly as it cooks to keep it from sticking to the bottom of the pan and burning. As the moisture cooks out, you will see that the mass begins to pull away from the sides and bottom of the pot as you stir. Once the oil starts to separate out, the cooking is done. 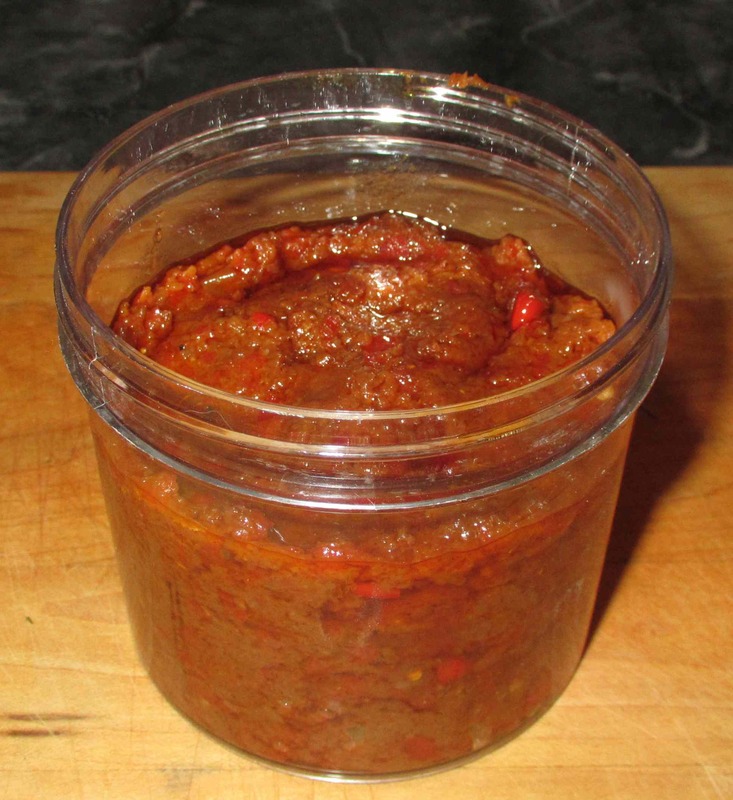 Allow to cool and then transfer to a suitable jar or other receptacle for storage. 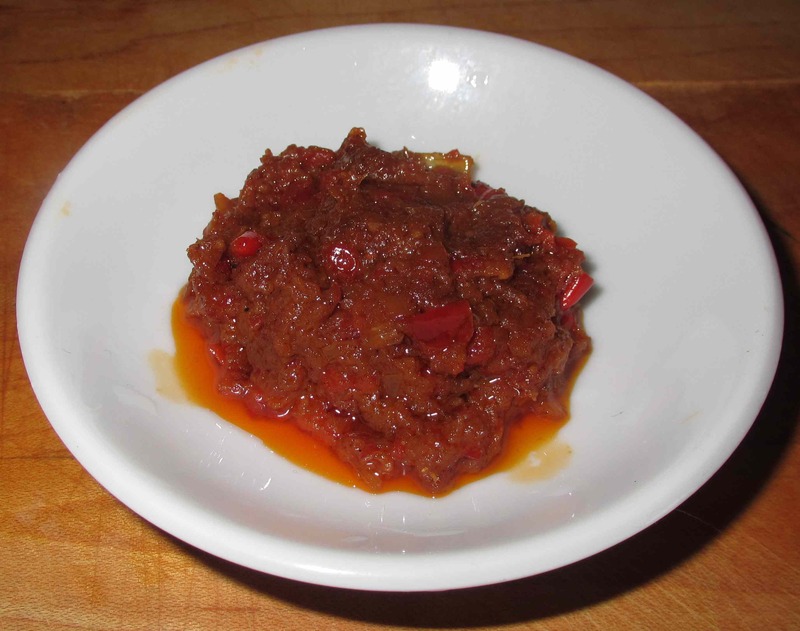 Taste-wise, this experiment came remarkably close to the commercial Sambal Belacan that my wife brought back from Singapore. 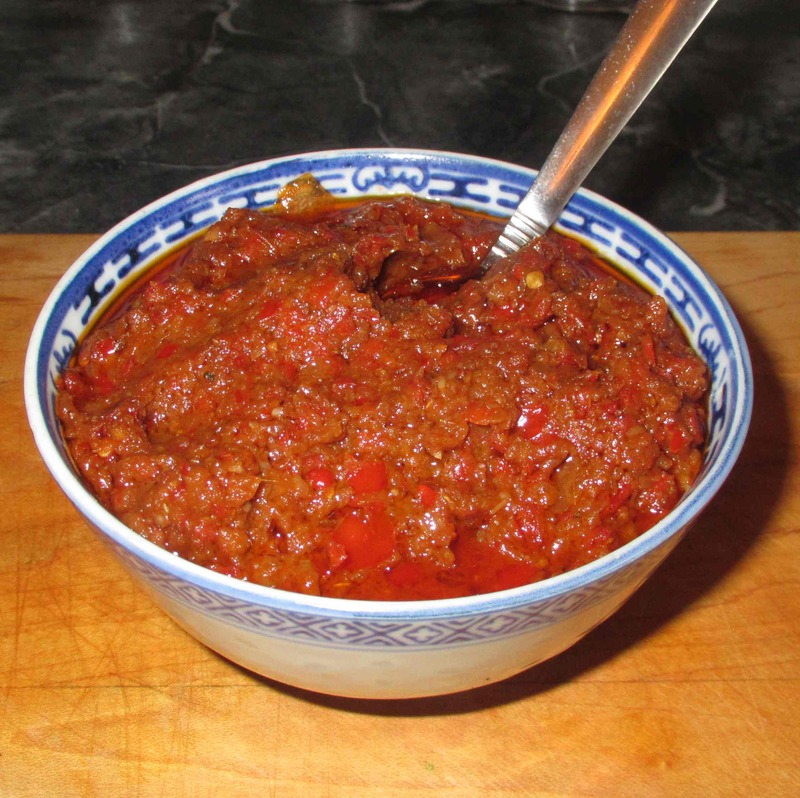 That product, however, was a little tangier than mine as I recall, and I rather think that there was more tomato in the blend. It was a also less of a chutney consistency than it was a smooth sauce and I think that, in a future experiment I may pass the blended paste though a sieve before cooking to achieve the same smoothness. Still, that being said, I am very pleased with the result and I am looking forward to using it. My further culinary plans for today were to Barbecue skewers of lamb with sesame, cumin and chili but the weather has been just too darn miserable so far. Unless things change, I may have to think of something else instead. Possibly a spicy lamb curry using this paste? Your fiery experiment seems to have worked well for you.